We’d love your help. Let us know what’s wrong with this preview of In a Gilded Cage by Susan Appleyard. To ask other readers questions about In a Gilded Cage, please sign up. I thoroughly enjoyed this book! I have come to love historical fictions and was so excited to read this one. I don't think I have read anything about the Austrian Royal family before so this was extremely interesting to me. Reading this has made me want to learn more about them! I loved Sisi and my heart acjed for her lost childhood and innocence. I can't imagine being thrust into such a position after living a wonderful, carefree life. And, being a mother myself, my heart was broken when reading I thoroughly enjoyed this book! I have come to love historical fictions and was so excited to read this one. I don't think I have read anything about the Austrian Royal family before so this was extremely interesting to me. Reading this has made me want to learn more about them! I loved Sisi and my heart acjed for her lost childhood and innocence. I can't imagine being thrust into such a position after living a wonderful, carefree life. And, being a mother myself, my heart was broken when reading about the different situations with her children (trying not to give spoilers here). I do have to say, I would love to here more about Sisi's sister, Helene (Nené). To learn her thoughts and feelings about not being chosen and how her life was after going back home. Maybe I'm alone in thinking this, but I think it would make a great story. Another thing that I would love is for there to be a sequel! I want more! More about the next years of Sisi's life. More about her relationship with Franz, her mother-in-law, and her children. I just really want more! In a Gilded Cage was a great book and I am thankful to have been given the chance to read and review it! This is a good book with strong characters. 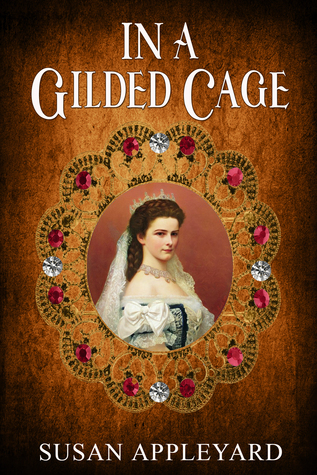 We are proud to announce that IN A GILDED CAGE by Susan Appleyard is a B.R.A.G.Medallion Honoree. This tells a reader that this book is well worth their time and money! Lake Starnberg, Bavaria. Princess Elisabeth “Sisi” Amalie Eugenie (15, daughter, Duchess of Bavaria) enjoyed her royal carefree lifestyle roaming the hills with Bummerl (dog). Duke Maximilian Josef (Bavaria, Sisi’s father), & Duchess Ludovika “Mimi” (Bavaria, Maximilian’s Sisi’s mother) were the parents. Sisi’s sister), Karl Theodor “Gackel” (Sisi’s brother), Queen Marie Sophie “Madi” (2 Sicily’s, Sisi’s sister), & Countess Mathilde Ludovika “Spatz” (Trani, Sisi’s sister). The family were having a dinner to celebrate the Emperor Franz Josef (Austria) 23rd. birthday. Alexander Bach (minister of justice) & Count Ferdinand Buol-Schauenstein foreign minister) & many other family members & dignitaries were in attendance. Fast-forward Cardinal Rauscher would preside over the wedding ceremony of Emperor Franz Josef & Empress Elisabeth “Sisi”. The honeymoon in Laxenburg was over. Politics, countries upheaval, & war were the topics of governmental discussion. What news did Dr. Seeburger have for the couple? Later; the Feast of St. Stephen was on the agenda & then on to cathedral for Mass. 4/1855, the baby was crying, Sophie had a girl. Baroness von Welden was in charge of the nursery staff. How will all the aristocrat’s lives turn out? Kings/Queens, foreign politics, war, & romance all rolled in to 1. A very awesome book cover, great font & writing style. Wow, a very well written Bavarian 19th. Century historical fiction book. It was very easy for me to read/follow from start/finish & never a dull moment. There were no grammar/typo errors, nor any repetitive or out of line sequence sentences. Lots of exciting scenarios, with several twists/turns & a huge set of unique characters to keep track of. This could also make another great Bavarian 19th. Century movie, or better yet a mini TV series. A very easy rating of 5 stars. 18 would read another book by this author. 17 thought the cover was good or excellent. 18 felt it was easy to follow. 18 would recommend this story to another reader to try. 6 felt the author’s strongest skill was ‘plotting a story’. 12 felt the author’s strongest skill was ‘developing the characters’. 17 felt the pacing was good or excellent. 18 thought the author understood the readership and what they wanted. I really appreciated this book! For like the first time ever, a fictional novel has focused on Sisi as an actual person. So many times, authors get stuck on Sisi’s obsession with her beauty and the fact that many claim she was “eccentric” and “mentally unstable.” This book actually focused more on Sisi’s humanitarian works and desire to help Franz rule his empire (rather than the role given to her of just being a beautiful arm accessory). It was refreshing and allowed the readers to see the real I really appreciated this book! For like the first time ever, a fictional novel has focused on Sisi as an actual person. So many times, authors get stuck on Sisi’s obsession with her beauty and the fact that many claim she was “eccentric” and “mentally unstable.” This book actually focused more on Sisi’s humanitarian works and desire to help Franz rule his empire (rather than the role given to her of just being a beautiful arm accessory). It was refreshing and allowed the readers to see the real side of Sisi. The kind, caring, and brave person that she really was. I also appreciated the author’s word choices. The book was clearly very well researched. A historical romance about the Austrian Royalty in the 1800's. The customs of the times in Austria were difficult for young women. Arranged marriages, little or no independence. Women everywhere had difficult lives and very little power over their circumstances, but there were ways for an intelligent independent female to get her way. A very interesting view of the lives of women who influenced history. Enjoyable read for all. I don't think I have a particularly unique writing method. I always write in the mornings in a place where I can work relatively I was born in England where I learned to love English history. Now I live in Canada in the summer with my three children and three grandchildren. In winter I flee the cold for Mexico where I enjoy the sun and sea, restaurants on the beach and Happy Hours with my friends.